We had a visit from Lola – an adorable young German Shepherd Lady who we initially saw for tummy problems and ended up with Tonsillitis. But this time it was something different: A day after she had been excessively playing with her BFF in the dog park, Lola seemed lethargic and she refused her food – which is so unlike her! She had a temperature and drooled excessively with a tiny little bit of blood in her saliva every now and then. With Tonsillitis your dog will be showing symptoms like discomfort, lethargy, head shaking, indications of trouble swallowing, continually pacing, loss of appetite and maybe a fever. In the back of the throat are little crypts (pockets) where food debris and other bacteria can accumulate. This debris will harden and calcify after some time, forming tonsil “stones”. If not removed, the tonsil stones will be painful and may become infected. But in general smaller dogs are more susceptible to tonsillitis than the larger breeds – except when the inflammation is caused by a foreign body. So Kathrin decided to investigate this in more detail under general anesthesia. She opened Lola’s jaws wide, and inspected the back of her throat. This is when Kathrin caught a glimpse of something green in one of Lola’s tonsil crypts, which had a very swollen tonsil. 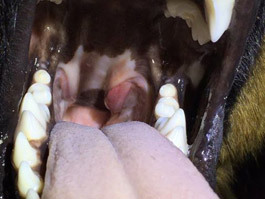 The area around the base of her tongue and her tonsils has been bright red, and Kathrin found small pieces of grass and little stone material (How on earth did you manage to do this, Lola?!) and she carefully picked them all out with tweezers. Lola recovered very quickly after having the foreign material removed and is back to her playful nature. And the team at Ellerslie Vets is happy for Lola that none of the grass seeds managed to work their way deeper into the tissue in Lola’s throat as they could have started migrating in her body and could have caused severe problems.